So you’re in your mid-thirties and you decide it’s a great time to completely self-produce and release an album under the name LCD Soundsystem. It receives critical acclaim and now you’re making a “cover” band out of friends and other musicians to go out on tour with. Years later the band is about to make you and the band massive stars as it is on the cusp of a breakthrough on the charts, yet you decide it’s time to call it quits and end the band. Some call it masochism, others a crippling fear of success, but you are resolute. And you’re going to hold the funeral, a massive last concert, in the most historic venue in New York Madison Square Gardens. 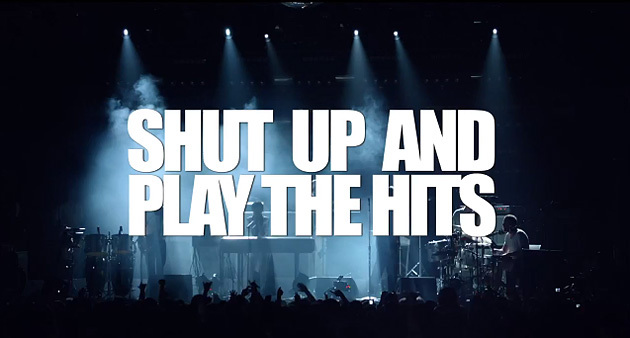 This is the premise behind Shut Up and Play the Hits. 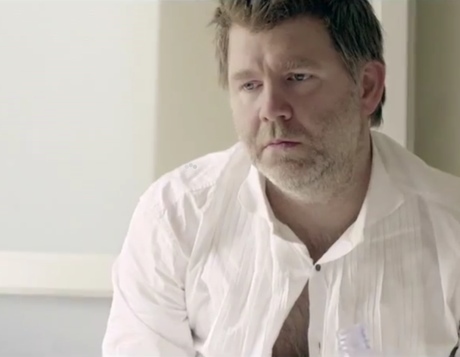 The film is from the viewpoint of the man behind the whole phenomenon, James Murphy. We start after the show with Murphy waking after the festivities – his dog nearly steals the show here, and goes about the task of putting things in perspective. Murphy also has to deal with the logistical headaches of packing a massive amount of equipment away for good. This is interspersed with concert footage from the big night. A third timeline is also introduced which serves as a narrative for the film, a recorded interview with famed reporter Chuck Klosterman. We follow Murphy through his day and his slow realization that it’s all over, leading to a powerful scene in the equipment storage room. All while we hear the prodding questions of Klosterman over the events of the day. Seeing this for a second time after Hot Docs earlier this year, I found myself focusing in more on the musical performances and the nuances that Murphy shares on stage with his band mates. The Klosterman stuff comes off as cloying as ever and it still is downright grating in parts, but the music really carried me through more this time around because I knew that the Klosterman stuff was going to annoy me. The music sounds just as vibrant and resounding the second time around, maybe even more so. The music alone makes Shut up and Play the Hits a worthy watch and I give it a recommend. What I highly recommend though, if you do have interest in seeing this, is checking it out on the big screen with the amazing sound system at the Hot Docs Bloor Cinema during its 2 DAY ONLY limited run (apparently it will also be playing across Canada on other select screens on those two days as well, check your listings) this week only, July 18th and 19th.